Summer is not only a popular time for weddings, but for anniversaries as well. Memorable Gifts has a beautiful collection of anniversary gifts to celebrate the joy and longevity of your favorite married couple. Join us for this list of unique anniversary gift ideas, all with personalization from Memorable Gifts. 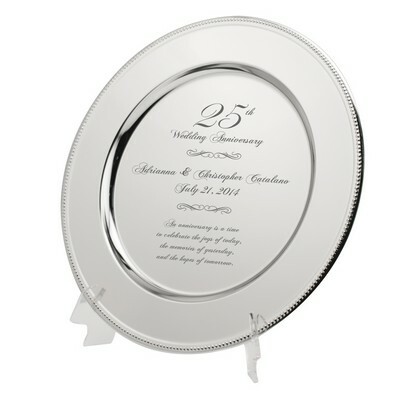 The traditional gift for the silver anniversary, this exquisite 25th anniversary keepsake plate measures a full 12 inches. The large silver-plated face offers ample room to customize the gift with the couple’s names and anniversary date, a personal message or romantic poem, the options are endless! 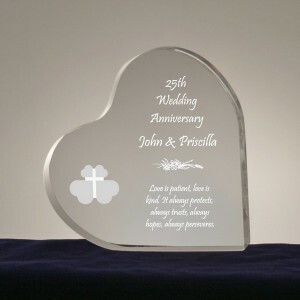 Help your friends or family members celebrate their commitment with this acrylic heart anniversary plaque. Featuring the Christian symbol of the cross, this heart can be personalized with the anniversary date, the husband’s and wife’s names and offers room for a personal message or favorite Bible verse. For a classic wedding anniversary gift, this beautiful rosewood mantle clock is a stunning choice. 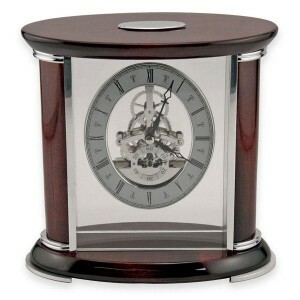 With a Roman numeral clock face, rosewood design and silver accents, this is a clock to be treasured and admired. Personalize this amazing gift with the couple’s name and anniversary date on the plate that rests on the top of the piece. This anniversary gift combines the tradition of a clock with the traditional marriage symbol of two interlocking rings. This anniversary clock is ideal for personalization, with room for a name above the pre-etched verse, along with room for a two-line salutation and a date at the bottom. Celebrate the one you love with this romantic anniversary keepsake! The conventional sentiment of two halves of one heart gets a modern twist with this split silver heart key chain. 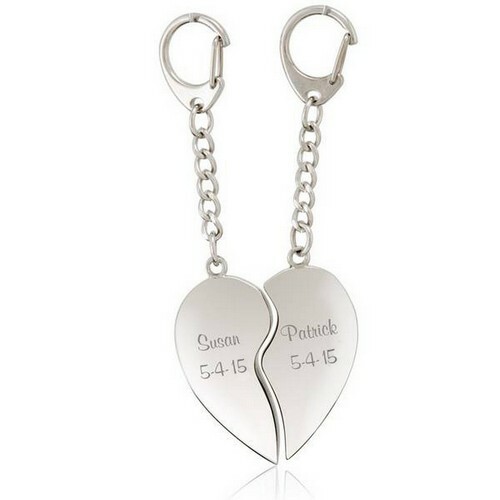 Each side of the heart measures 1 3/4″ by 1 1/2″ and can be personalized with the name and anniversary date, making an ideal 50th Anniversary gift from spouse to spouse or for any special couple in your life. Add romance and charm to an anniversary celebration with this double-heart cutout frame, which features two heart-shaped cutouts for displaying a 4″ by 4″ and a 3 1/2″ by 3 1/2″ photos. This adorable frame has room to include the names and anniversary date, along with space for a four-line message, verse or sentiment. Bring back those feelings of flirtation and infatuation with this adorable Sitting in a Tree anniversary mug. 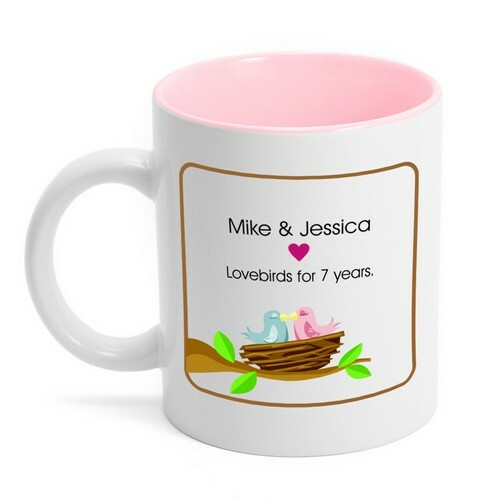 The personalized mug features two lovebirds k-i-s-s-i-n-g, and has room to depict the couple’s names and number of happily married years. Makes an ideal gift for the husband and wife who are still young at heart! For those lucky couples celebrating their golden anniversary, offer this commemorative 50th anniversary frame. 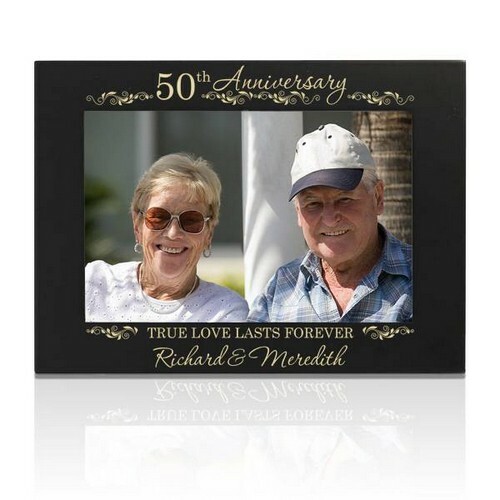 This dark wood frame has a silver accent around the 4″ by 6″ photo opening, and comes with the “50th Anniversary” heading and the sentiment “True Love Lasts Forever” underneath. 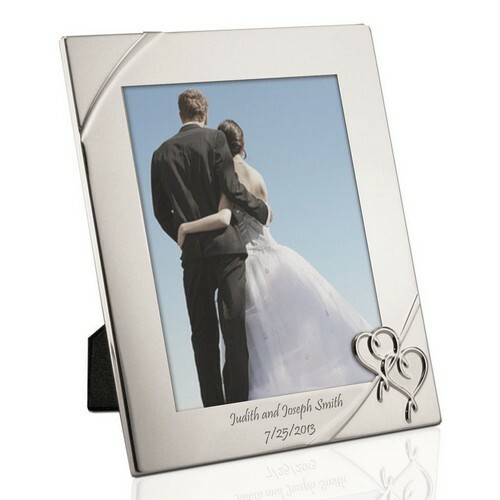 Add a personal touch with the couple’s names engraved at the top of the frame. For the couple that has acquired many years worth of photos and fond memories, present this lovely black photo album box. The leatherette box features white stitching detail, modern flap closure, and a photo frame built right into the lid. This anniversary gift holds up to 144 4″ by 6″ photos and can be customized with up to two lines of text. 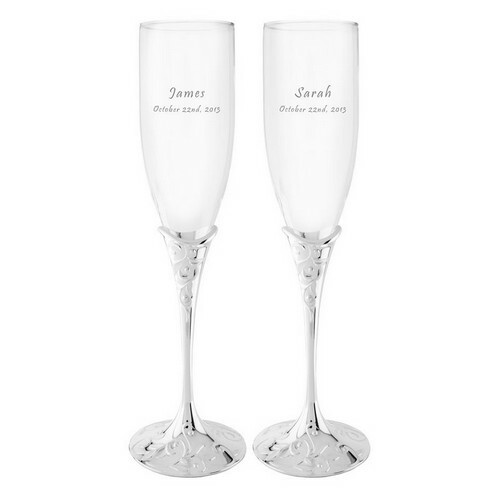 Make their anniversary celebration one to remember with these crystal champagne flutes. These elegant toasting glasses hold seven ounces of liquid, and are ideal for customizing with the husband and wife’s names and wedding anniversary date. At Memorable Gifts, we love to help our customers delight in friends and family, and a wedding anniversary is a great time to celebrate! Our array of anniversary gifts range from traditional to contemporary and can help you recognize newlyweds and exalt those with long and lasting marriages. With Memorable it is easy to take time to toast and congratulate the ones we love!